A very observant Rochester Falconcam forum member brought to our attention that there appeared to be an injury to Beauty’s left foot, between the two left toes. We sent pictures of the injury to Barbara Loucks at the NYS DEC, who then sent them on to their veterinarian. According to their Vet, it’s unlikely to be bumblefoot due to its location between the digits and on the upper surface. It is most likely an abscess from a penetrating wound or from a foreign body. They are not always painful because the body walls it off. It will not necessarily make Beauty ill. While we cannot be certain, it is a possibility that she was injured during a battle. Barbara would like to remind us that, in her experience, many birds survive fine with injuries like this one and live long lives. Beauty may have this thicker foot area forever if it doesn’t progress. Pictures of the affected area on Beauty’s foot will be sent to Barbara weekly, so that the DEC and their Vet will be able to observe the progression of the injury. If the infection progresses and worsens, the DEC will consider treating Beauty by leaving prey items injected with antibiotics near the nest site. We would like to thank Ei, a long time member of the Rfalconcam forum, for bringing this to our attention. It allowed us to quickly notify our friends at the DEC about Beauty’s condition and get their expert opinions. A Quick Update (5/30/12): As requested, we will be sending pictures of Beauty’s injured foot to Barbara Loucks of the NYS DEC weekly. This is so she will be able to share the pics with their vet, showing the progress of the injury. We sent some pictures last night (5/29/12) and have already received a response back from Barbara stating that their vet did not think it looked significantly different. We will continue to send pictures weekly to the DEC so that they may continue to monitor the progression of Beauty’s injury. Well, well, well. Who would have thought that we’d be posting this update so late in May. But, that’s just the kind of year we are having here in Rochester, NY. This morning at approximately 8:19 am, Beauty laid her second egg. Dot.ca was at the Times Square Bldg most of the day. In fact, he brought at least two meals to Beauty this afternoon and took his turn watching over the eggs. For over two hours, he stood with his wings slight open in the hot sun, protecting the eggs from the direct sunlight. Also, before laying her 2nd egg Beauty put the old egg, laid by Unity, underneath her. We are certainly no experts, but it is believed that this egg would not be viable after all this time. But, it is very interesting that she and Dot.ca are now treating it like one of their own eggs. This egg was laid while Unity and Archer were together at the Times Square Bldg and is much lighter in color than the two eggs Beauty has recently laid. This evening, Watchers witnessed Beauty and Dot.ca copulating on the SW corner of the Wilder Bldg. So, will Beauty lay a third egg? Be sure to stay tuned and keep watching. I think all of us here at Rfalconcam were losing hope of ever making this announcement this year. Imagine our surprise when the forum came to life this afternoon. Tweets were coming through fast and furious to the Watchers that were out checking on the Rochester Falcons. After all the turmoil and uncertainty of this year, Beauty has laid an egg. Virtual Falcon Watchers around the world watched Beauty as she entered the nest box this afternoon. She’d been doing that a lot recently, but this would be different. Today, at approximately 5:27 pm, she laid an egg (Wednesday, May 16th). So, what happens now? Will Dot.ca help Beauty incubate this egg? Will she lay more eggs? Will this egg hatch? We’ve been hearing reports from other nest sites. Most have young eyases already hatched. Banding days have been scheduled in many cases. Fledge Watches are being planned. In Rochester, if this egg does hatch, we will be far behind all the others. There are so many questions that we don’t have answers for. Stay Tuned and keep watching the cameras. It’s too early to know, but maybe, just maybe, we will yet have young Fledglings gracing the Rochester skies. We have been informed that the missing content cannot be recovered. We are going to resume normal operations of the site without it. This means that the Forum and FalconWatch blog are now open for use. Missing posts will need to be entered again. Members who joined the Forum after March 8 will need to register again. Any changes made to member profiles after March 8 will need to be made again. Pictures lost from the Archive will need to be restored from external sources if available. Much work needs to be done to restore lost web pages and site infrastructure. We will work on this before attempting to restore pictures from external sources. Talk about a soap opera. So much has happened since we announced the loss of Unity, our resident female falcon. So many things have changed for our Rochester Falcons over the past weeks. 2011 was very quiet compared to 2012. 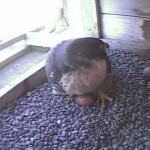 2012 started out quietly, with so much promise for a successful falcon season after two failed nest sites last year. Unity remained at Kodak Park, aka Eastman Business Park, by herself. We hoped that a male would come through on migration and become her bonded mate. Beauty remained downtown at the Times Square bldg. She was visited this winter by a male falcon aka Tiercel. The Rochester Watchers dubbed him “Mr”. Back in February, we posted that Beauty was injured in what we assumed was a territorial battle with Unity who decided it was time to move to better digs. Beauty was taken by the DEC to a rehabber to recover from her injuries. Unity and Mr became quite an item, and then Archer returned from his migration. Archer was the resident male who tried to maintain two nest sites last year with Beauty and Unity. Mr disappeared and Unity and Archer were reunited. We continued to get update statuses on Beauty’s condition from the DEC. She was doing great. It was just a matter of time before she would be released. Archer began to reacquaint himself with Unity. He bonded with her, bringing little gifts of prey to show her what a great provider and hunter he was, capable of taking care of their young. She accepted and soon they were seen copulating. 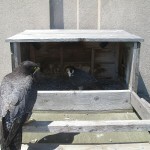 Unity laid her first egg in the nest box on top of the Times Square bldg. Then, one evening, Archer returned to the nest box with what appeared to be injuries to his leg or legs. We will never know what caused this injury. For the next week or so, Watchers saw that Archer could fly, but he wasn’t able to land using his legs. He was spotted on different downtown buildings, mostly lying down and using his wings to support himself and move. Unity was seen standing near him, as though she were watching over him. Then after a couple days of not being seen at all, on April 2nd, he was seen on the base of the Mercury statue. One of his legs looked to be out to the side and hanging lower. But, he had a full crop and had been getting food somehow. We hoped that he was on the mend and that he would soon be joining Unity again. That was the last day that Archer was seen. By the evening, a new male came into town and was attempting to woo Unity. The Rochester Watchers attempted to find Archer, but they were not successful. They still look for him, hoping that he just left the area, knowing that he could not battle a healthy tiercel. The new Tiercel entered the nest box for the first time and thanks to the main camera, he was ID’d as Dot.ca a 2010 Tiercel hatched at the Etobicoke – Sun Life Centre nest site in Canada. On Monday, March 26th, the DEC notified us that Beauty was ready to be set free. She was released on a sunny and windy day at Montezuma Wetlands Complex. Her flight was strong and true. She never looked back, heading east, soaring higher and higher. The Watchers were notified that she had been released and that there was a good chance that she would return to Rochester. She considered this to be her territory. The DEC thoughtfully placed blue tape with a red stripe over her silver USFW band. This would help the Watchers to easily ID her if she returned. Unity and Dot.ca bonded and we all hoped that Unity would lay a 2nd egg. It was not meant to be. On Good Friday, April 6th, Unity was hit by a car near the Rochester Central Library while on the ground struggling with a pigeon. It is unusual for an adult Peregrine to come to the ground, but it happens. Watchers were told by a passer-by that he thought one of our birds had been hit by a car. By the time they arrived, Unity was gone. That evening many of the Rochester Falcon Watchers gathered in front of the Times Square bldg. Dot.ca was sitting on the platform in front of the nest box. 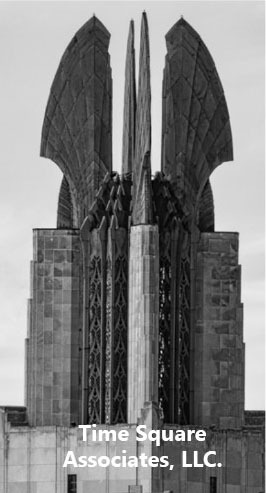 The Watchers knew that Unity would not return. Dot.ca finally left the nest box and flew around a bit, ending up at the southeast wing at the top of the Times Square bldg. That’s when one of the Watcher’s said that there was a 2nd Falcon in the air. They watched as a larger Peregrine flew through, sweeping Dot.ca off of his perch high above. Now they were both in the air and both seemed to be agitated. The larger was a female and she landed on the same place that Dot.ca had vacated. He was aggressively trying to get her off of his building. The Watchers set-up scopes and attempted to get a good look at this newcomer. A murmur went up, this bird was dark. She seemed familiar and not familiar. She took off and flew into the nest box, where finally the cameras positively ID’d our new bird. There was the band covered in blue tape with a red stripe. She wasn’t new, she was Beauty. She had finally returned and she was letting this strange tiercel know that this was her nest site. In one day we lost Unity and regained Beauty. Now what would happen? Would Dot.ca except Beauty and would Beauty except Dot.ca? These were the questions buzzing between the Rochester Watchers and the folks on the Rfalconcam Forum. Over the Easter weekend, the Rochester Watchers kept a close eye on the situation. For the next few days, Dot.ca aggressively chased Beauty off every time she came close. He did not want her there. To make it worse, a sub-adult female Peregrine (2 years) kept flying in, and battling with Beauty. We had seen a sub-adult come in one time when Unity was there. Unity chased her off and she was not seen again until then. Finally, the young Peregrine left and Beauty and Dot.ca remained, still uneasy with each other. Since then, Beauty has regained her territory. Every day, Dot.ca will arrive and land on the Times Square building on his favored perch, the south east wing at the top of the building. He is not as aggressive as he was in the beginning, but is definitely not accepting Beauty as his mate. 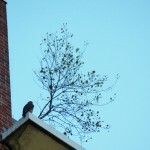 In fact, an adult Peregrine has been seen hunting and flying with a sub-adult Peregrine on the south side of the city. Could this be Dot.ca and the young falcon that battled with Beauty over the Easter weekend? You can bet that the Rochester Watchers will be out there keeping an eye on ALL the Rochester Falcons. As we get information, we will share it with you here. We here at Rfalconcam do not take any of this lightly. The Peregrine Falcon is a wild creature that faces many hardships. Many do not survive their first year. 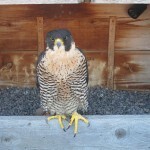 By observing them, we will all continue to learn about the Peregrine Falcon. Now for an update! Like we were saying, many Peregrines do not survive their first year. But we are here to tell you about a success story. A young female that made it through her first year and is thriving. All of you that have been following the story of the Rochester Falcons know that we have been watching a young female at the Brighton location. We’ve been calling her SA for sub adult. The Rochester Watchers have been trying very hard to get pictures of her bands to positively ID her and give her back her proper name. First, we saw that she had a black over black band. so we knew she hatched in Canada. Second, we were able to see that the silver USFW band was covered in green and red tape. Hmmm, that was interesting. That was something that our friends at the DEC, Barbara Loucks and Mike Allen, came up with to help the Rochester Fledge Watchers better ID the juvenile falcons. A different color for each fledgling. Mark Nash of the Canadian Peregrine Foundation adopted this same practice up in Canada when banding their young. So, we had a young falcon from Canada, with green and red tape over her USFW band. We were getting closer. Finally, after intense picture taking and scope watching hours, the Rochester Watchers finally were able to get some pictures that showed most of the letter and numbers from the black over black band. They were very fuzzy and hard to read. We hoped it would be enough. The pictures were sent to our friends from the Canadian Peregrine Foundation who track these numbers and this is the answer we received from Tracy Simpson, CPF. “Meet Pigott. I have 43 over X. Of the top digits, the 3 on the right is very discernible and on the left, the only number with straight lines that are both vertical and horizontal is 4. Combined with the green and red tape on the USFW band, the evidence is overwhelming. I have attached below a little history on her name so that you can share with others where the name came from. This is great news! She was a 2011 hatch and if you look on the Hamilton Sheraton (CPF) site where she was hatched, you`ll see that she had a bit of a rough go of things during fledge with a couple of rescues required. Thank you Tracy and many thanks to the Rochester Watchers (Joyce, Dana, MAK, Kathy O, Larry O & Carol P) who spent so much time attempting to get the band #’s. 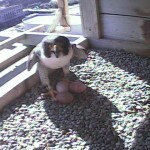 Because of all of you, we are happy to announce the proper given name of our 2nd female Peregrine Falcon. Welcome to Rochester Pigott! No progress was made overnight on restoring the missing content. There appears to be a disconnect between the customer support staff and and the technical staff at our service provider. We are waiting to hear back from a manager we contacted late yesterday. The service provider has contacted us and has escalated the problem to a high priority. There is a chance that the missing content will be restored. We should know more tomorrow morning. A hardware problem of unknown origin struck the Rfalconcam website yesterday morning causing it to go offline for nearly 12 hours. When it was restored, the last 2 months worth of modifications to the site including Forum posts and membership applications, FalconWatch and Imprints reports, and pictures in the archive were missing. We are trying to get some answers from our service provider, but have not received any replies to our queries. In the meantime, we have locked the Forum in order to prevent additional losses. An update will be posted as soon as we know more. You are currently browsing the Imprints blog archives for May, 2012.